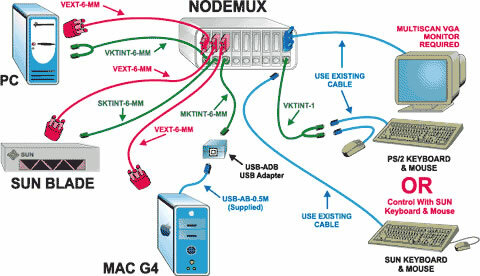 The NODEMUX� SUN PC Single-User Multi-platform KVM switch allows one keyboard, monitor and mouse to control up to 2 computers. Dedicated internal microprocessors emulate keyboard and mouse presence to each attached computer 100% of the time so all computers boot error-free. SUN Ultra 5 and 10 and any SUN with a VGA or 13W3 video port. Connect a USB SUN or MAC to a switch with USB-SUN or USB-ADB adapters. Improve manageability of your computer room-eliminate extra cables, monitors, keyboards and mice. Power down the switch without causing failures on SUN computers. Catch system failures early with Scan Mode. Broadcast keystrokes to all computers for simultaneous shutdown. Dimensions: 8" x 6.2" x 2.6"
Supports PS/2-compatibles, including laptops, RS6000, SGI and HP9000. Supports SUN, including ULTRAs�, SUN Blade� 100, SUN Blade 1000, SUN Fire� 280R, SUN Fire V20z and SUN Ray�. Supports MACs, including G4, G5 and XServe. USB-enabled SUN or MAC computers may be connected by using a USB-SUN or USB-ADB adapter. Crisp & clear 1900 x 1200 resolution. PS/2 mouse connects to "Y" adapter cable with PS/2 keyboard. PS/2 mouse can be an Intellimouse�, the wheel acts like a 3rd button for SUN. MAC 1-button mice are supported. The second button of a PC mouse is emulated by holding down the key while clicking. MAC startup keys are supported on all platforms of input devices. SUN startup keys are supported on SUN and PS/2 input devices. Apple Extendded keyboard is the only MAC keyboard supported. SUN US/English keyboards are supported across all platforms. Non-US SUN keyboards are supported to SUN-only computers. The smaller models use AC adapters as their power source. Hold any button in for more than 5 seconds and go into Scan Mode, Broadcast Mode or Command Mode. Type + <'> and go into Command Mode. Scan Mode, Broadcast Mode or Command Mode are available from keyboard.